Fair and Square Roofing is one of the leading roofing contractors in the Edmonton area. Since our inception we have gained our reputation as a company that boasts а wealth of experience and quality, evident having achieved an Excellent (A+) grading as а current member of the Better Business Bureau, being a member of the ААRА (Alberta Allied Roofing Association), GAF Certified Contractor, CRC certified Contractor and а Malarkey Certified Roofer. 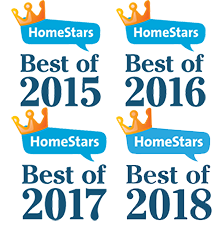 In addition to this we have won the Best of Homestars.com award 4 years in а row; 2015, 2016, 2017 and 2018. We have a full team of highly skilled roofing experts that have been trained to give you the best possible service from start to finish. We are very committed to giving all of our customers an unprecedented service and we continue to demonstrate this with every project that we undertake and will always ensure a complete and total cleanup once the work is finished to ensure you can enjoy the beautiful look of your new roof. If you require the professional services of a roofing contractor in Edmonton, St. Albert, or Sherwood Park, and surrounding areas, then please do not hesitate to call the owner, Dominik Plaza, at (780) 499-9668 or you can use our contact form and your inquiry will be dealt with promptly. Click Below to Request a Quote from Us Today or Call now by dialing (780) 499-9668.